Welcome to the home site of Bulhaven Bullmastiffs. I am fortunate to have built these pages to brag about our breed and to share the dogs I own, bred and love with everyone who visits. I hope that you can laugh, learn and smile from my site and enjoy the photos as you navigate thru each page. I built this web site myself and encourage suggestions or comments as you view the pages. I request that any errors be forgiven as I am still working on "fixing" the site so it is all "just right". I hope that you enjoy the pictures but please do not try to take them or use them elsewhere. All of the information provided is in my own words and is from my own personal opinions and experiences. Don't forget to sign my guest book before you leave and let me know your thoughts! Now about me... I purchased my first gal in 1991 after careful consideration of all the possible Working Breeds. I immediately fell in love with the Bullmastiff and in 1990 I was put on a breeder's "waiting list" for my first Bullmastiff puppy. In February of 1991 the most beautiful fawn Bullmastiff I have ever had the pleasure of owning and loving was born into the Bullmastiff community. Her ancestry proved itself in her elegance and presence while Kali majestically earned her place on my couch and into my heart along with attaining her AKC Championship Title in short order. Kali captured my heart in many ways and managed to give me a mystical passion for the breed. I have since established my own "family" to share my home with. I call it "BULHAVEN" because it is a little bit of "heaven" for my "bullies". I do not consider myself a 'breeder' but rather a 'fancier' as I only breed a litter every year or two. I breed only after carefully studying every possible breeding combination until ultimately finding that special "match made in heaven". I have been blessed with bringing some beautiful babies into the Bullmastiff world. I have had the pleasurable opportunity to become "grandma" to many new Bullmastiff owners. I spend most of my time showing, training and loving the dogs I have and own. When I do have a litter, I live and dream with them until the day comes when I finally let them go to their loving and waiting families. Until then, I take every breath they take to assure they are properly socialized and cared for before their adventure into the big world. 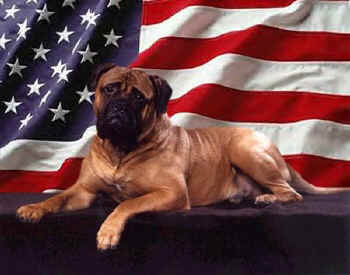 I have had many Bullmastiffs who have proven their success in and out of the show ring, adding to my "family" several mentionable "stars" and "stripes". I have AKC Champion Titled Bullmastiffs across the US with several others who are pointed and currently working towards their AKC titles. I owner handled my own Bullmastiff to one of the Top Dogs in the country, ranking in the AKC's Top Ten for two solid years. I was named the Top Owner Handler for the American Bullmastiff Association for 2006 and 2007 while ranking in the AKC's Top Five. With the same dog I won the American Bullmastiff Association's very first Top 20 Event, owner handled. I've bred and owned Regional Specialty Winners, National Specialty Futurity winners, National Specialty Sweepstakes winners as well as Best in Show winners in Foreign Countries. I am proud to announce my first Canadian Champion as well as several Rally Obedience Certificate holders. Equally important to our success in the show ring, all of my Bullmastiffs are enjoyed and cherished by families and friends living comfortably in home environments. I have also had the pleasure of being involved with the Delta Society Therapy Dog International Program, bringing sunshine and tail wagging enjoyment to the lives of those in need. I am happy to find that my Bullmastiffs have become a part of the Therapy Dog Programs across the country, making people feel well by sharing their own hearts. I hope you enjoy my pages, I will be adding more pages often.. check back often! Thank you for visiting. My life has a superb cast, but I can't figure out the plot"